Wisconsin State Journal reporter Barry Adams dropped in for a visit to SPEC Machine late last week to see what was new on the Chicago & North Western No. 1385’s restoration since his last visit to see Mid-Continent’s flagship steam locomotive one year ago. You can read the full Wisconsin State Journal article and view the numerous photos at Madison.com. Steel for the new boiler will be cut this week (February 20, 2017) at Continental Fabricators in St. Louis. 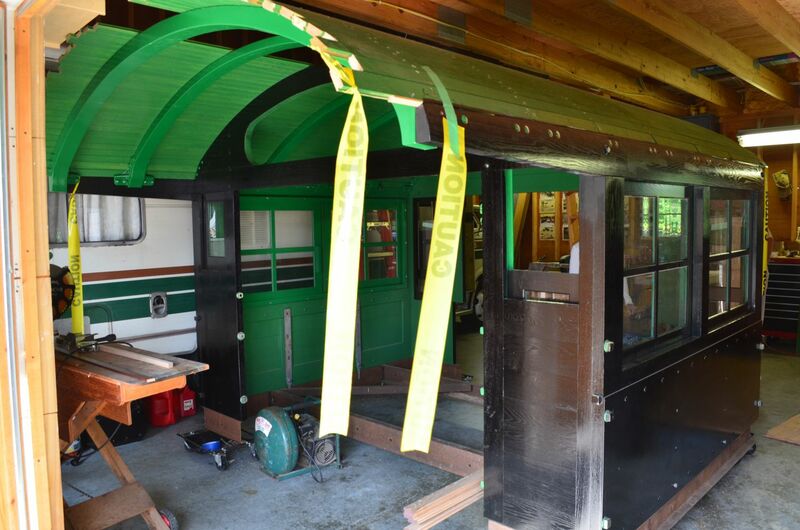 Additional steel will be cut and shipped to Tennessee Valley Railway Museum where the new firebox is to be crafted. 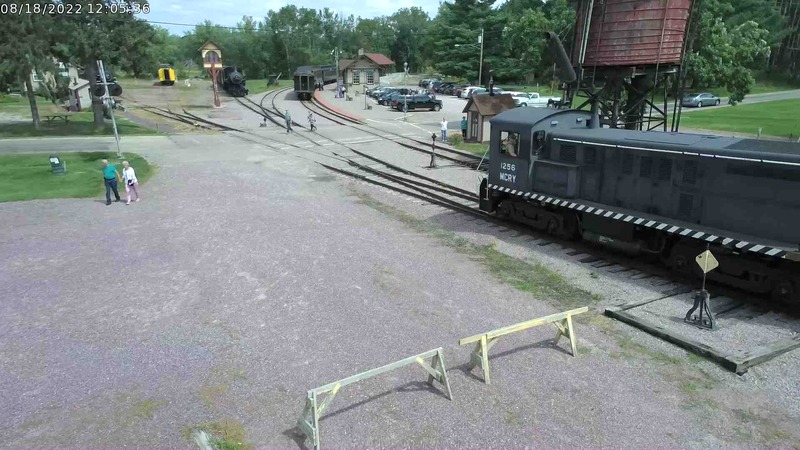 The firebox will be delivered to Continental Fabricators in St. Louis, Missouri, attached to the boiler, then shipped to SPEC Machine in Middleton, Wisconsin where it will join the running gear and cab for final assembly. Arrival of the finished boiler is now expected for June 2017. 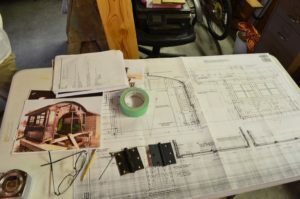 SPEC Machine is building a 1,500 square foot expansion to their shop to facilitate final assembly of the 1385 on-site. 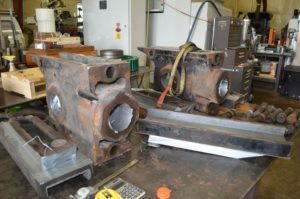 Other upcoming projects at SPEC Machine include refurbishing brakes, installing pistons, rehabbing the superheater header, refurbishing the sand dome, and the many other parts that are yet to be installed. Mid-Continent’s goal is to have No. 1385 fully assembled and returned to the rails in 2018. Work continues at a steady pace on Mid-Continent’s Chicago & North Western No. 1385 steam locomotive. 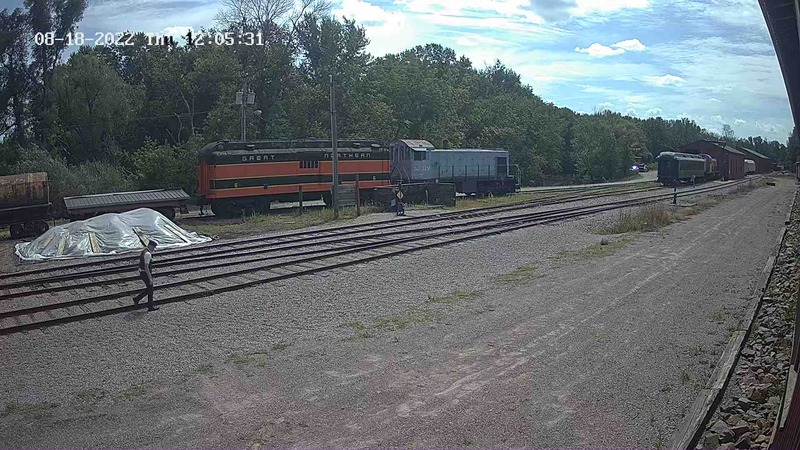 SPEC Machine’s Steve Roudebush took some time out of his day on August 24, 2016 to show off the latest progress on the locomotive’s rebuild for this report. The change most instantly noticeable upon walking into the shop was the shiny, like-new front truck sitting in the center of the shop floor. Like-new may not be a fully appropriate term, as considerable portions of the front truck are new. 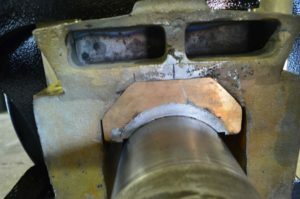 One wheel set had a goodly amount of life left in it and merely required machining to bring it into proper profile. 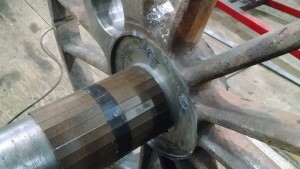 The second wheelset had been worn quite thin and needed to be replaced with a brand new wheelset forged in Pennsylvania for the 1385. Binders, spring hangers and truck equalizers were also created new to replace heavily worn originals. 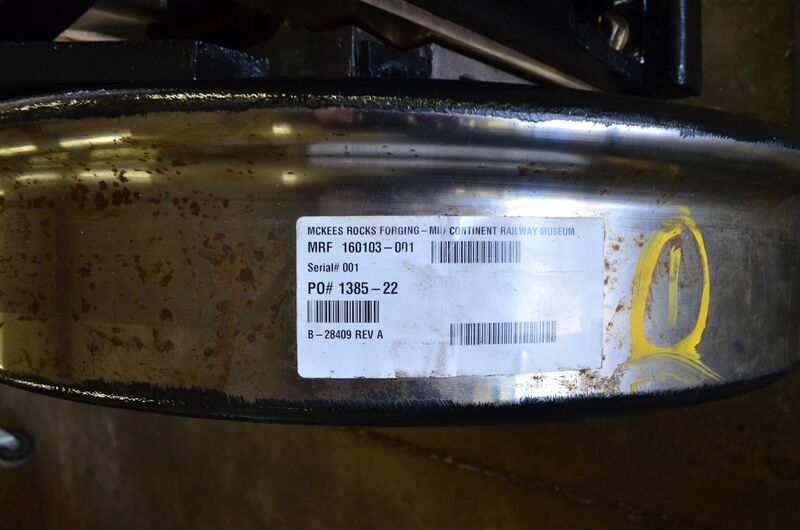 Manufacturer’s sticker on new wheel for C&NW 1385 front truck. Additional work on the front truck included pouring Babbitt, lining the pedestals with bronze, and polishing pins and bushings. 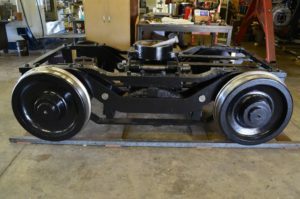 The front truck is fully complete and ready to be rolled under the locomotive, which is anticipated to happen sometime in September. 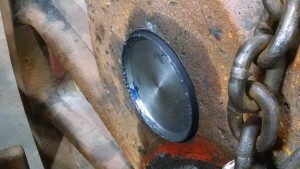 Detail of bearing on one of C&NW 1385’s front truck wheels. C&NW 1385 running gear in the SPEC Machine shop. Above where the front truck will be rolled under, the pistons have been fully bored and the valve cages nearly completed. 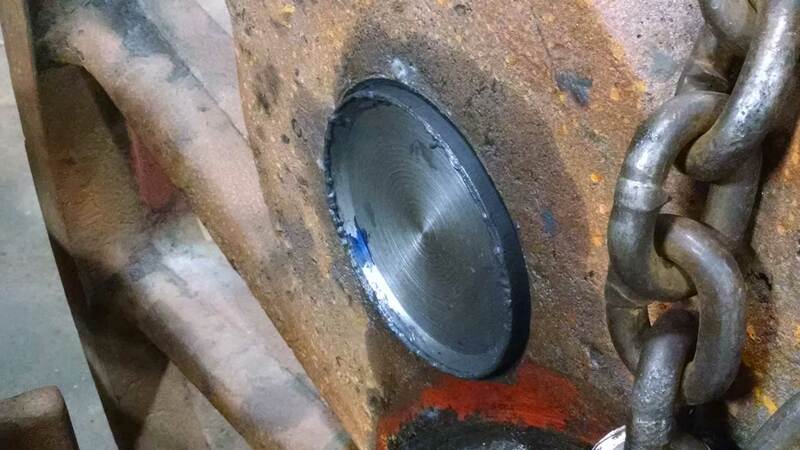 One of the valve cages that was found to have cracks is being replaced with a new one. The new valve cage is anticipated to be machined on SPEC’s CNC machine in the coming weeks. Work has also begun on the crosshead guides and valve gearing. After those tasks are complete, brake rigging and appliances will be next on the task list. 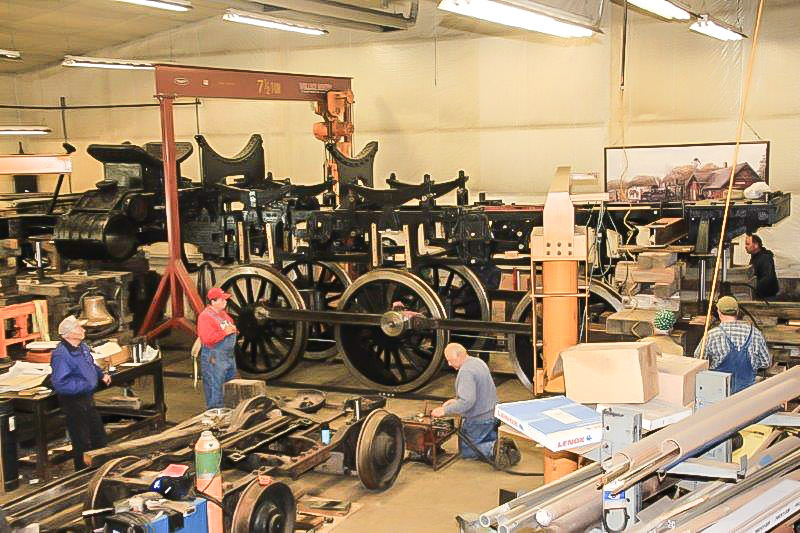 Refurbishment of the 1385’s crossheads and crosshead guides has begun. 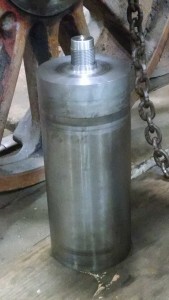 The cylinder has been bored and reassembly is underway. The two major components missing from the 1385 as it sits in the SPEC Machine shop is the cab and the boiler. To see the cab, we took a short drive to the shop of Loren Imhoff. 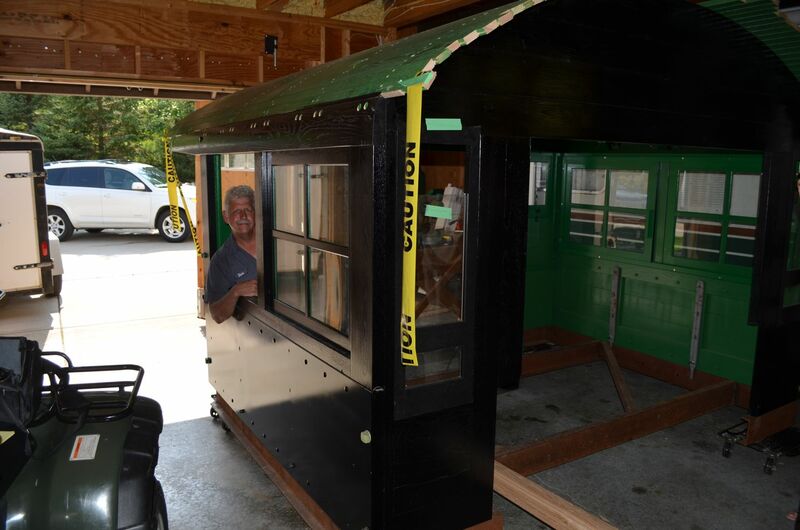 Imhoff has graciously donated all his time spent working on the cab. Inside was a nearly complete cab. Already quite sharp looking with a bright green interior and a black exterior, another coat of paint will be added inside and out. The ceiling vent, which had proven to be a challenge due to limited available drawings, was complete and functioning. A few items remained to be completed: the ceiling needs a few boards painted and installed yet, the windows need a few hardware items remade to replace lost or broken originals, the seatboxes are not yet constructed, but all is expected to be completed by October and the cab brought to SPEC Machine so it can be made ready to mount to the frame and the roof weatherproofing material applied. C&NW 1385 cab nearing completion. 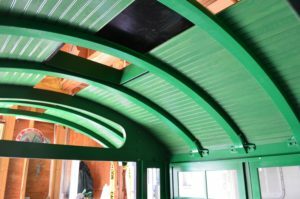 Cab ceiling and roof hatch. 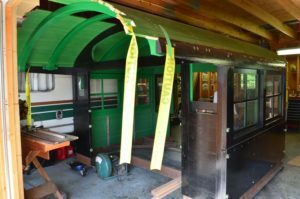 Steve Roudebush leans out the engineer’s window of C&NW 1385’s nearly complete cab. The other major component on which the 1385 Task Force has focused a great deal of attention on lately is the boiler. 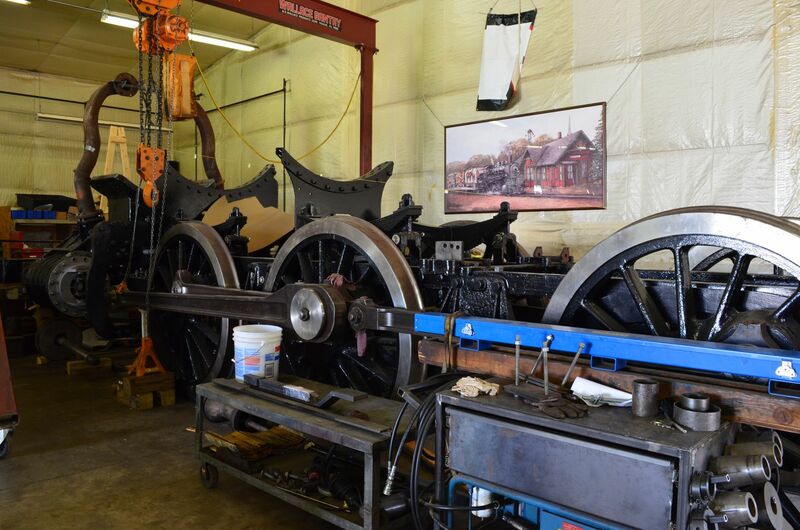 It has taken longer for the boiler to reach construction phase than was originally anticipated, but this was one area of the locomotive rebuild that was not to be rushed in any way. As the single most expensive component of the project, there is no room for error. Finally satisfied that the boiler design is ready for production, the 1385 Task Force has now begun gathering quotes for manufacturing of the new boiler. Once a vendor is selected and the order signed, production is expected to occur fairly quickly. The #1 driver crankpins are turned and only in need polishing. 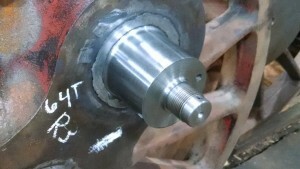 The #3 driver crankpin hub faces are welded up. The new R3 crankpin (#3 driver, engineer side) is pressed in and ready to be riveted over on the back side. The old R2 hubliner (#2 driver, engineer side) has been removed, its mounting studs are center punched, and ready to be drilled out. New hubliner material is on hand. A crack near the R2 crankpin hub has been chased out and welded up. The R2 crankpin hole has been bored out. The new R2 crankpin is being machined. Diagram showing driving wheel arrangement on a R-1 class steam locomotive. Driving (powered) axles are numbered front-to-back and specific wheels on the axles are defined as being on the left or right side. For example, L3 refers the wheel on the left side (fireman side) of the third powered axle. 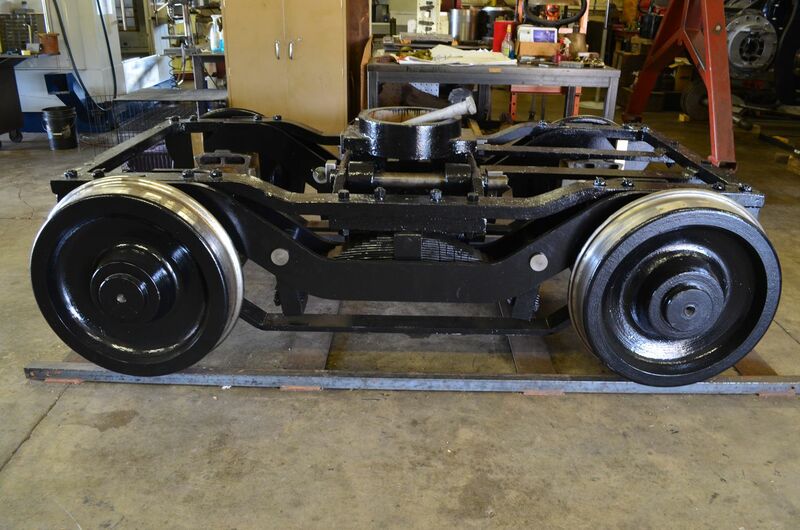 The estimated completion date for the driving wheels is the end of 2014. The biggest influence of whether the target will be met is uncertainty of the lead time for the delivery of new tires. The order of operations is to press all new crankpins in, then turn the tire seats on the wheel centers. The new tires will then be ordered to fit snugly to the final dimensions of the wheel centers. See the March 30, 2014 post for a further explanation of wheel centers and tires. 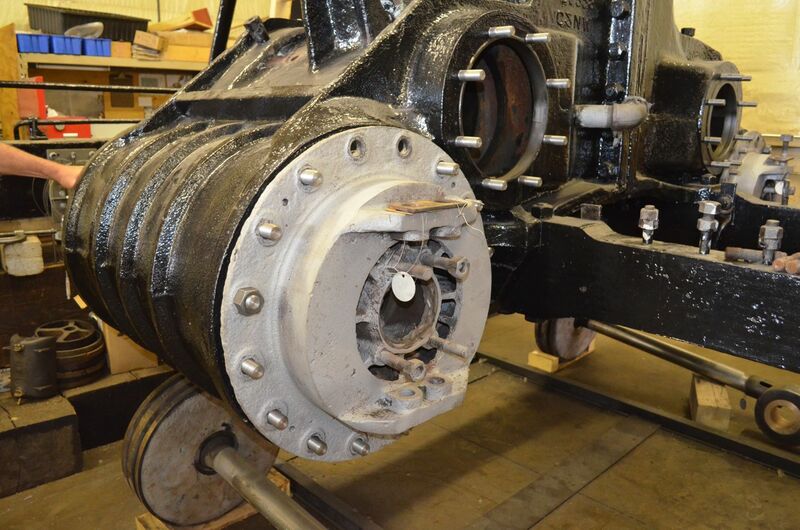 C&NW #1385 driving wheel repairs at Strasburg Rail Road. 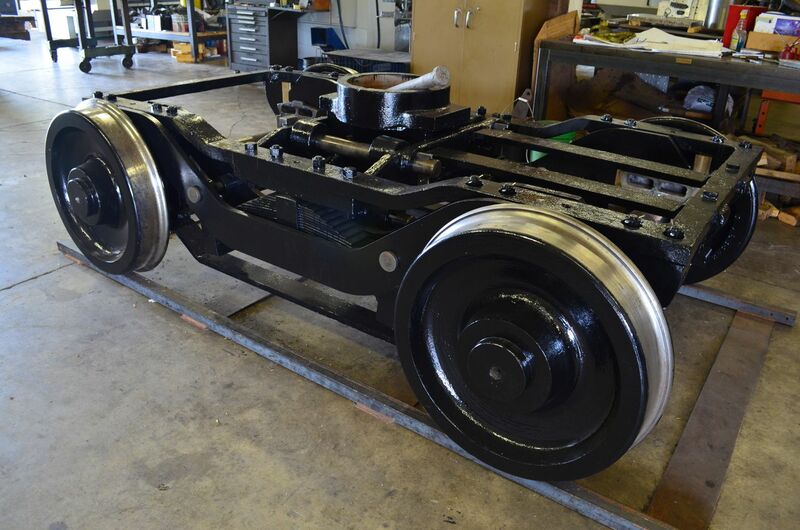 Work on the restoration of Mid-Continent’s ex-C&NW R-1 class ALCO locomotive, No. 1385, has quietly progressed through the summer months at SPEC Machine near Middleton, Wisconsin. Project photographer Brian Allen stopped by SPEC Machine’s shop on Tuesday, September 16, 2014 to provide some views of the recent efforts. 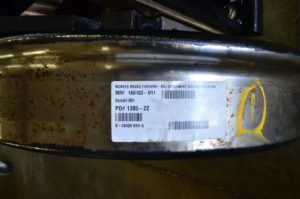 The photos catalog the extensive weld repairs completed on the locomotive’s frame over the summer (see July 1 post for additional details). On the day of the visit, work and discussion was centered on the spring rigging equalizers. 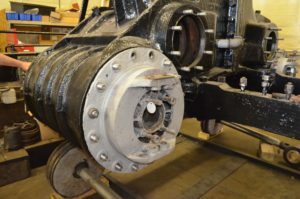 A locomotive’s spring rigging distributes the weight of the locomotive over the various wheels. Without equalizers, even small undulations in track elevation could cause substantial variations in how much weight is being supported by a given wheel. Such large variations would cause undue stresses to both locomotive and rail. In this series of photos, you’ll also see some components in fresh, glossy black paint. After months of stripping away layers of old paint and rust from the locomotive’s parts to reveal the condition of the underlying metal, seeing fresh paint being reapplied is a welcome sight!